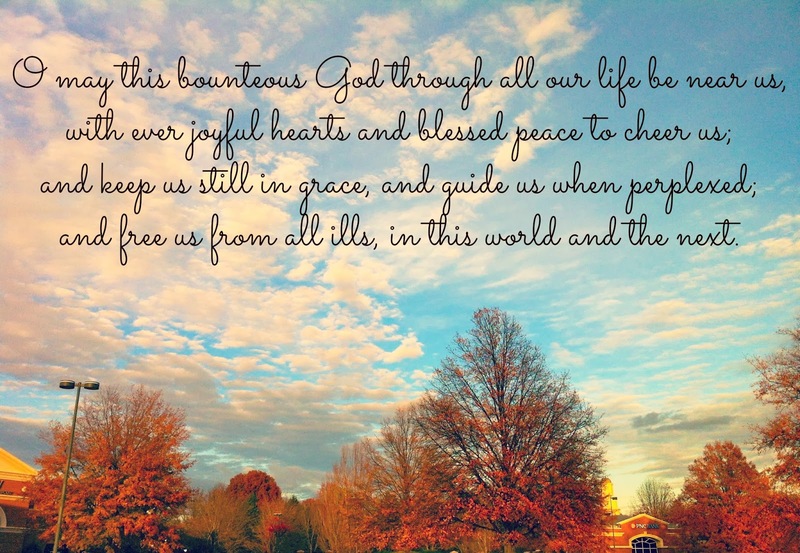 Ordinary Goodness: Ever joyful hearts and blessed peace to cheer us. "Now Thank We All Our God" is one of my favorite hymns. The second verse (above) captures so well what I feel and hope for on this day of thanks and in the years to come. Especially: Keep us still in grace. Keep us still, calm and hold us close, O God, surround us with grace, that we may recognize you within all our moments, joyful and perplexing, that we may give unbounded thanks all our days. Family. Those I've had from birth, and those I'm preparing to join. Supporters, uplifters, loving me always. Fiancé. His steadiness, smile, sense of humor, kind heart, bear hugs, cooking skills, love of family and so much more (including the fact that he puts up with my writing about him). Friends. Near and far, so many are like family. Laughter, tears, songs, prayers, food. Health. A sturdy body, friendly immune system, and the ability to see a doctor when needed. Church. I can count six communities of faith (eight, including my college fellowships) that have embraced me and given me open spaces to grow and learn about God - and taught me to embrace others, no matter their beliefs. Home. A cozy little house with heat, food, water, bed. Writing. This blog, my journals, my upcoming MFA program. The joy and satisfaction of getting words on a page. Books. Where would I be without the crinkle of pages, the smell of binding, the characters - real and fictional - who guide me, the authors who inspire? Work. I am employed, work alongside marvelous folks, and get to look up hymns and sample church supper desserts on a regular basis. Spin Classes. The people who have become my friends, the fun music, the exhilaration of heavy work. America. We struggle, and we're free. We argue, and we're free. We're far from perfect, and we're free. We keep striving, and we're free. Diversity. The bowled-over beauty of difference throughout this world, and the strands that always connect us. Ordinary Goodness. Singing, cooking, laughter, warm blankets, the relationships forged by this interconnected world, sports, sleeping in, dogs, trees, Southern hospitality, deep breaths, good movies, phone calls, hot tea, brisk walks, adventures of all kinds...This great, great life.